On Wednesday, The Texas Tribune reported on Texas A&M’s study commissioned by the state legislature, which investigated the link between oil and petroleum activity and automobile collisions. As the Texas Tribune highlighted, the report concluded that crashes related to oil and gas production total in the multi-billion dollar range. Most importantly, the study found that there is a direct correlation between the number of crashes and the areas in which wells were being added. Specifically, the study broke the period of time into two periods: 2006-2009 and 2010-2013, and the state into four regions: (1) Permian Basin, (2) Barnett Shale, (3) Eagle Ford Shale, and (4) the rest of the state. In comparing those two eras, the rest of the state outside of the oil boom areas had a 9% reduction in rural commercial vehicle crashes and crash injury costs were down 3%. 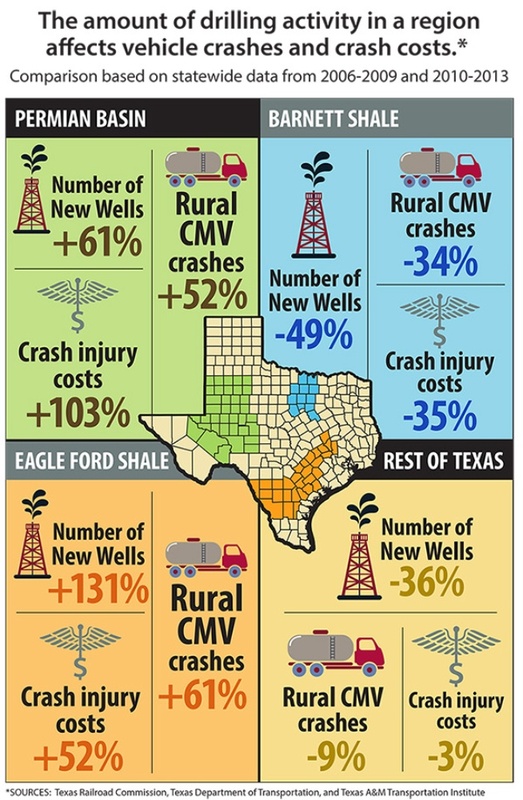 Meanwhile, in the most active oil and gas region, the Eagle Ford Shale, rural commercial vehicle crashes were up 61% and the crash injury costs were up 52%. Similarly, the Permian Basin had an increase of 52% of the rural commercial vehicle crashes and a crash injury cost increase of 103%. The legislature is now armed with the information it requested in 2014 and should be tasked with determining the best way to reduce the costly impact of peak oil and gas production times. One expense that the legislature has long grappled with is spending more on transportation infrastructure, especially on the rural roads used by the commercial vehicles. With safer roads, even during boom times, the Texas Tribune reports, the crashes may be fewer and the injury cost less severe.